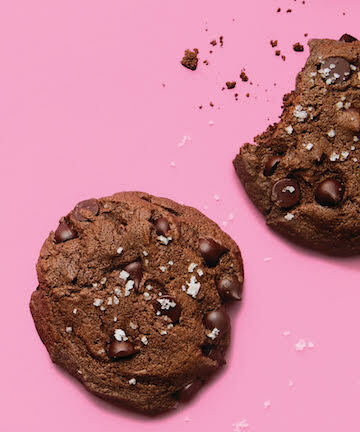 MAKES 3 DOZEN COOKIES Here, dark-chocolate dough makes the layered flavors of peanut butter a pleasant surprise, while chocolate chips and a kiss of salt catapult this salty-sweet treat to cookie-jar superstardom. Preheat the oven to 325°F. Line 2 baking sheets with parchment paper. In the bowl of a stand mixer, cream the butter, peanut butter, and sugars for 3 minutes on high speed. Add the eggs and vanilla and combine, scraping down the sides of the bowl. In a medium bowl, sift together the salt, baking soda, flours, and cocoa powder. Mix the dry ingredients into the butter mixture and fold in the chocolate chips. Scoop a heaping tablespoonful of dough at a time and place 2 inches apart on the prepared baking sheets. Gently press down on the mounds to create a flat top, sprinkle with fleur de sel, then bake until the cookie tops just start to crack, 15 to 18 minutes.